A. Soma Khatun’s family was fortunate in a sense of comparison, certainly in the eyes of many of the poorest local Bangladeshis and the Rohingyas living in the makeshift camps in Leda and Kutupalong. They were registered as refugees by the Bangladeshi government run UNHCR. They’ve MRC numbers, which qualifies them for food ration. The World Food Program handles the responsibilities of food distribution. They have recently started implementing a systematic change, from food coupons to a digital fingerprint scanning process. Some members of the family would get their fingerprints scanned and would get issued a barcoded food card, complete with photo ID. The selected members of the family would then have to queue and given the number of Refugees in the camp, these queues form long lines, zigzagged around the distribution building, which is along the well kept road between the main gate and the row of the camp officials offices. They would have to present their card and get their fingers scanned and receive their ration. Prior to WFP, the Red Crescent handled the food distribution. However the allocated amount was small and was not sufficient for the needs of the Refugees. They would have to go out of camp to purchase food. Now with the newly implemented changes, they have a choice of items which can be “purchased” using the balance from their food cards. The shop staff will even ask if there are any particular items that they wish to obtain. (In addition to this systematic change, some unregistered “makeshift” camps are now eligible to receive food ration. This is very good news for the unregistered refugees that are living near the registered camps. More than 200’000 live in these areas. Prior to now, some unregistered refugees were eligible only for non food items such as soaps etc.) One could be thankful for the ration but they have no rights within the country and no laws to protect them. They technically are not supposed to be carrying money or leave the camp for work. Many people do though. Generally in order to leave the camp, the Refugees would have to obtain a written permission to leave by an official such as the Camp-In-Charge, for good reason such as doctors visits, if they are fortunate enough to afford them. Many of the refugees have grown up in a Bangladesh camp and are generally taught the Bangla language. Being able to speak the local language, the Refugees can get by well outside of the camp. It is those who only speak Rohingya and Burmese who would run into trouble, especially at police checkpoints positioned along the roadside, before and after the ship’s dock for St. Martin Island, or near “Friendship Road” (where locals can make day trips to Myanmar to visit family), heading towards Cox’s Bazar town which is the nearest hub, 85 km away from Nayapara. There are 4 checkpoints between this camp and Cox’s Bazar. Even if refugees are given written permission (which is often just something crudely written on unofficial paper), they can face harassment and embarrassment at these checkpoints. It’s not just the checkpoints to be worried about if you were amongst this group of people. The Communities are living near the Naf river and given it being so close to Myanmar, these are considered “sensitive” areas. Not much goes unnoticed. The sheds they are living in are in quite poor conditions. These bamboo huts quickly deteriorate, gets damaged by the insects and the elements. The fencing requires fairly constant mending. The main and obvious issue is the polythene (plastic) sheets on the roof, which is used to keep the rain from into seeping into the sheds. These polythene sheets are often torn and patched several times over. There is a buildup of leaves in sections of the roof, causing the weakened Polythene to droop and pool water. When it rains it fails under the strain and water pours into the small enclosure. Generally, a roof of this construction and in that area, the plastic will need replacing once a year- that is if you are fortunate. These roofs haven’t seen new polythene this year and maybe not have been replaced in the last year either. Maintenance costs of the sheds thus far, have been donated by the international community. The responsibilities for the distribution of polythene amongst other maintenance products belongs to the UNHCR. Some sheds receive it and some get turned away because apparently there is no available budget for it. The quarters are cramped with full families, sometimes with up to 7 people in the small space of these 10’x 10′ sheds. It’s dark, hot and often damp in the sheds. No fresh flow of air to be found in these cramped spaces. There is however good hope in the camp with recent approval for new accommodations. Or so told by the local UNHCR to the refugees. Those are the, safe to say, deplorable conditions of the living quarters of the refugees in the camp. However, despite the struggle to feed their family, the lack of rights and very sub par living quarters, A. Soma Khatun had a family and they were fortunate to be living together. As mentioned, she never quite recovered from the birth of her 3 month old son. Finding yourself ill, doesn’t usually turn out well in these camps. In the IPD there are very few beds in working condition. 6 or 7 of the 30 that had been donated are useable. There are no water pipes or such water facility to the diarrhoea room. There is an electrical connection in the clinic but according to refugee patients, it’s rarely turned on; not even to power the overhead fan to cool the sick patients within. Refugees know that if their condition is not critical and they speak with the MOH doctors, they will be scolded and sent away, or perhaps made to wait for very long periods of time to be told there is no medicine to treat their illness. In the case of A. Soma Khatun, there is no real surprise that her condition had reached such a critical point before she was brought to the MOH clinic to ask for a referral to IPD. After a long night of vomiting and diarrhea, was taken the the MOH clinic at 6 in the morning, only to find the doors have been locked tight. The other Refugees tried to contact the doctor, who then told her to wait for centre to open at 9am. By the time she was admitted to the clinic, Khatun was barely able to lift her head to take water. She wasn’t administered saline despite the request of her family and their explanation of her dehydration. The day was Monday, September 8, 2014. A. Soma Khatun was said to have taken her last breath at 10am. Sadly she never was referred to the IPD by the camp clinic. They kept her body at the clinic and was only handed over to her family at 1pm for burial. According to refugee witnesses, the police came to the MOH clinic for an investigation where the doctor gave a false statement about her death: “The police from Teknaf Police station came and investigated into the matter and the doctor explained to the police, whispering softly, that she was rushed to the Hospital after she had died at home, then the Police went away. Which is completely false statement to the Police by the Doctor.” The local UNCHR has since been investigating the case. It’s terribly sad and heartbreaking for the husband and the two children she had left behind. Her children will likely grow up and spend the rest of their days in Nayapara camp. This is not a reality that the Bangladeshi government would like to see. They wish to broker a deal with Myanmar return Rohingya refugees. A history of asylum for the persecuted, stateless people spotted with forced repatriation. The worst of which in 1997 where hundreds were sent back to Myanmar against their will and by force. On a fairly regular basis there will be rumours or outright statements made by local authorities that there have been a deal made with Myanmar government and that they would begin repatriating refugees. There will be write ups in local newspapers stating the same. Recently, there had been multiple international and local news articles with a similar statement that a deal had been brokered for repatriation of just under 2500 Rohingya refugees. Before it made the news the word was out in both of the camps. The government is planning to send these registered refugees back to Myanmar within two months. The refugees said that the ones who would be sent back would be those who signed an affidavit in 2005 after being brought to court in Cox’s Bazar. (This, the same time that the next case of forced repatriation occurred.) The said affidavit, according to the refugees had been signed by force. It stated that they were Myanmar nationals and that they agree to return there. Almost two weeks after the articles circulated and tensions grew in the camps, the Myanmar government made a statement denying the claim of the repatriation agreement. There has been demonstrations in the camp in that time period. Those people and all Rohingya refugees that we have talked to have made it very clear that they will not return to Myanmar voluntarily until their requests have been met. The main request being the restoration of their citizenship and human rights. Many say that they would rather die than return without change. If the seemingly impossible but hypothetical scenario had occurred that saw a repatriation deal be made, the next issue for the refugees returning would be the lack of protection and dignity in the process of return. It would be carried out with the cooperation of the two countries and without the supervision of the international community. For more than 20 years, Rohingya refugees have been taking asylum in neighbouring countries such as Bangladesh to escape violence and persecution in their motherland of Myanmar, particularly in Rakhine (Arakan state.) The government have been writing them out of their citizenship and rights; excluding their name from the census and refusing to acknowledge the existence of the the Rohingya ethnic group within the country. The government are claiming them as Bangladeshis who have come to Myanmar illegally. Their (Muslim) religion in former Burma is a very small percentage of the majority Buddhist population. Over the past few years, Myanmar Muslims (who are citizens, not Rohingya), have faced violence and discrimination. There are nationalist anti Muslim groups with a thin veil of Buddhism who are allowed to distribute propaganda and speak publicly to instill fear and discrimination and promoting violence against this religious group. So, hundreds of thousands of Muslims (mainly Rohingya) have become displaced within their own country. 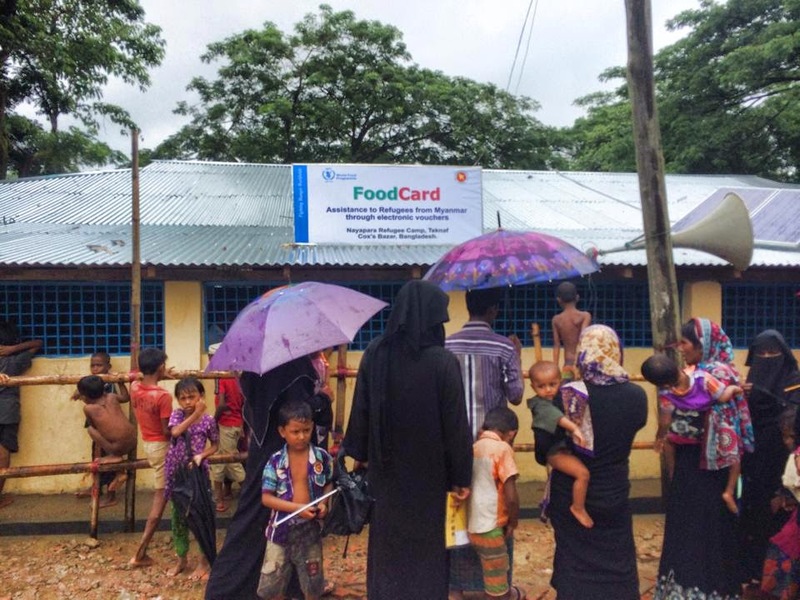 While it is encouraging and possibly gives new hope with the recent new changes to the food rations for the Refugees and recent approvals for new housing, many still fear the discrimination and the prospect of forced repatriation by the Bangladeshi government. More important for current issues faced by the Refugees is the critical need to improve and maintain a respectable standard for the health care facilities in the camp so that cases like A. Soma Khatun should never happen again. Posted on September 23, 2014, in NEWS and tagged abdur rahman, another, another life, bangladesh, birth, blessed, border, camp, care, child, claims, country, life, medical, medical care, news, refugee, refugee camp, refugees, rohingya, son, substandard, world. Bookmark the permalink. Leave a comment.